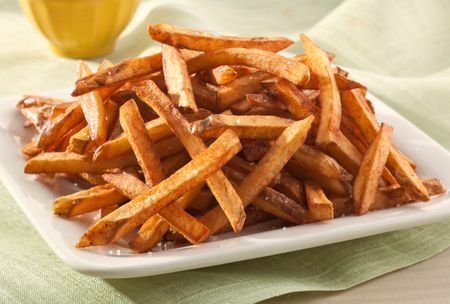 Cut the potatoes into “french fries” – thin strips lengthwise and soak in cold water for at least 30 minutes. Drain, rinse and spread potatoes into a single layer on a baking sheet. Sprinkle with desired seasonings and evenly drizzle with avocado oil. Toss to evenly coat potatoes. Cook for about 35 minutes – flipping 1/2 way through cooking time. Switch oven to HIGH broil for 5-10 minutes (depending on how crispy you like them). Enjoy as a side or with homemade burgers on the grill!